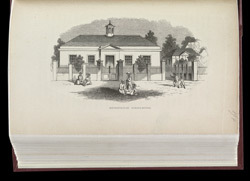 Illustration from James Mursell Phillippo's 'Jamaica: Its Past and Present State.' Phillippo was a Baptist missionary who travelled to Jamaica in 1823 and remained there until his death in 1879. He founded a number of schools, including the Metropolitan School Rooms, which were established in 1825. In addition to learning to read the Bible, pupils were taught Greek history, mathematics, geography and astronomy.